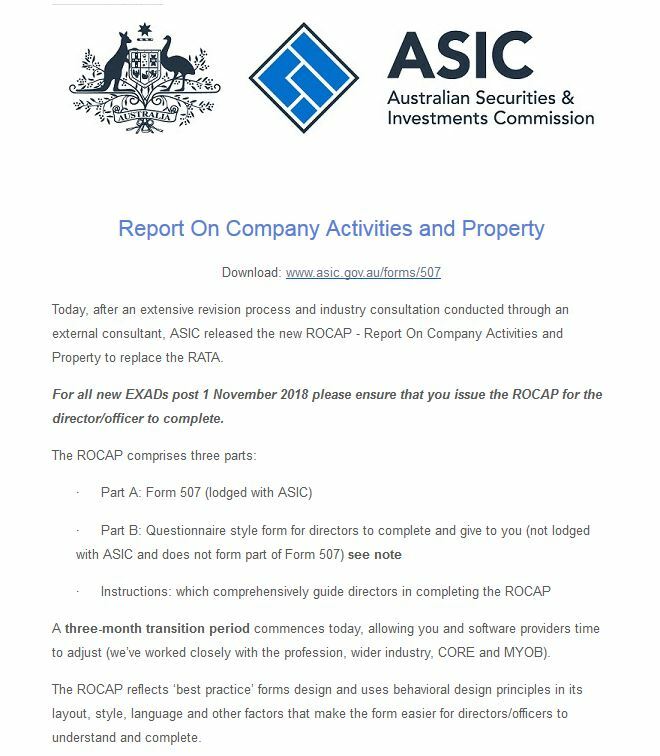 In an email to liquidators on 1 November 2018 the Australian Securities and Investments Commission has notified liquidators that its Report as to Affairs (RATA) form – Form 507 – is to be replaced by its new Report On Company Activities and Property (ROCAP) form – which comprises a new Form 507 plus a questionnaire. Directors and officers of companies entering into insolvent administration are required to complete the form and questionnaire. 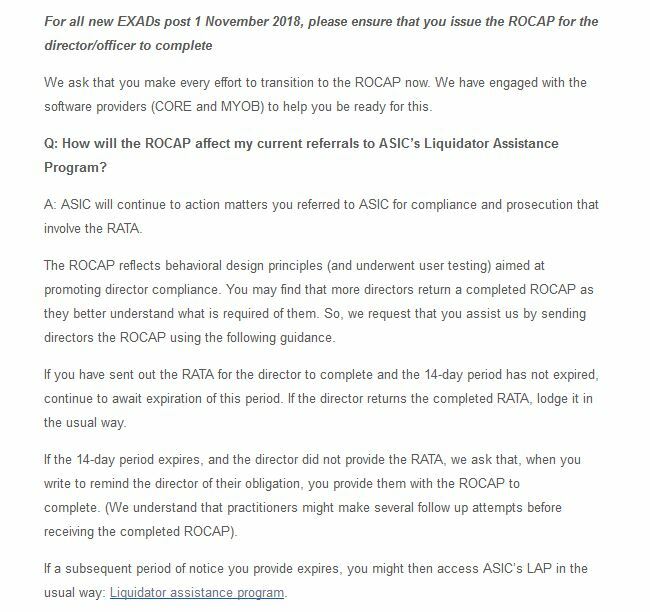 Liquidators have been asked to issue the new ROCAP to directors for all new External Administrations after 1 November 2018, but says there will be a three-month transition period to allow software providers to catch up with the change. A copy of the email is reproduced below. For more about the new form and questionnaire, see my post “Framework of new Report as to Affairs (RATA) drafted by ASIC” (19/10/2018). 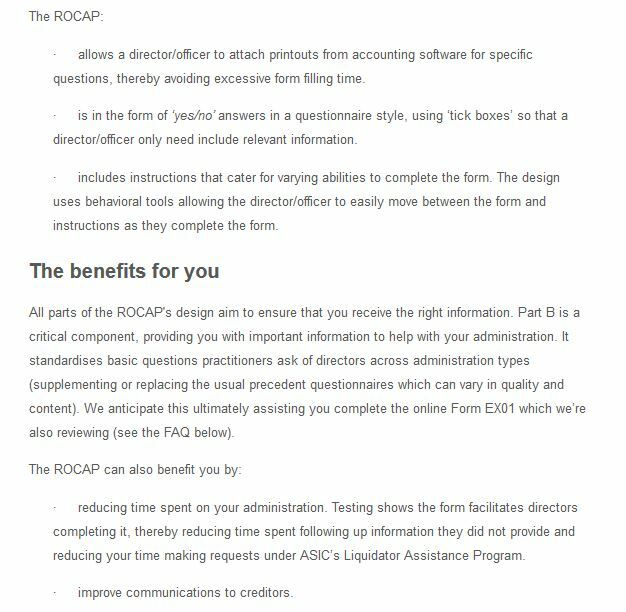 The new forms are available from ASIC: click HERE for the new ROCAP and HERE for the Instructions. On 1 October 2018 the Australian Securities and Investments Commission (ASIC) released a draft of a new Report as to Affairs (commonly known as a RATA). 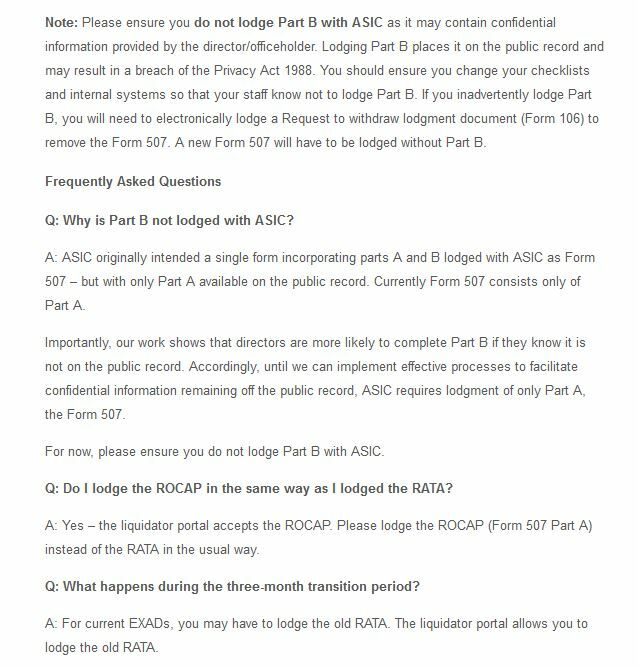 A copy of this form, which includes detailed instructions, may be downloaded from my website or from this ASIC journal. The new name of the report is to be Report On Company Activities and Property (ROCAP). ASIC intends releasing it in November 2018. During the June 2015 hearing in Canberra of the Senate Economics References Committee’s inquiry into “Insolvency in the Australian construction industry”, Mr Dave Noonan, a national secretary in the Construction, Forestry, Mining and Energy Union (CFMEU), listed what he thought were the main causes of business failure in the construction industry. In doing so he was drawing largely on figures published by the Australian Securities and Investments Commission (ASIC), which gathers that information from liquidators and other external administrators. It’s the latest example of these ASIC statistics being quoted as if they were accurate and credible. In the CFMEU’s case, Mr Noonan took delight in agreeing with a Dorothy Dixer from a friend in the Senate (Senator Doug Cameron) that “the CFMEU was not named as one of the major reasons for corporate failure in the construction industry”. The inference was, of course, that the statistics proved that the CFMEU was not a problem for the industry. What some of those who quote these ASIC statistics may not know is that the categories of causes from which external administrators must choose are predetermined. In other words, in nominating causes of failure external administrators must select from a list of categories created by the ASIC. Also, one of those categories – one which gets a large number of ticks – is labelled merely “Other”. Furthermore, and curiously, the information given to the ASIC by external administrators appears, on the face of it, to be at odds with the widespread belief amongst the insolvency community, unions and regulators that many business failures, especially in the construction industry, are the result of fraudulent phoenix activity. Which raises the question of whether the number of permitted categories of causes need to be increased, and/or whether the categories need to be modernised, broadened and clarified. The ASIC compiles its statistics on the causes of failure from information supplied by external administrators when they fill out their statutory reports online (Form EX01, Schedule B of ASIC Regulatory Guide 16). In filling out these reports – i.e., in nominating the causes of a particular corporate insolvency – external administrators must select from 13 categories of causes, which are shown below in the order established by the ASIC and using its exact words. This list of categories has existed for at least thirteen years. The only change since 2002 has been to alter the name of cause number 13, from “None of the above” to “Other, please specify”. For those with business savvy, a rough definition of most of these ASIC categories can be deduced from their titles. (Which is just as well, because there is no official explanation.) But some categories – particularly “Fraud” (ASIC cause 8) – are vague and broad, and would benefit from the ASIC stating exactly what they mean. These top three nominated causes have been the same for the past four years. It appears that “Other” (ASIC cause 13) may be a close fourth. What is fraudulent phoenix activity? “The concept of phoenix activity broadly centres on the idea of a second company, often newly incorporated, arising from the ashes of its failed predecessor where the second company’s controllers and business are essentially the same. It is important to note that phoenix activity can be legal as well as illegal. Legal phoenix activity covers situations where the previous controllers start another similar business when their earlier entity fails in order to rescue its business. Illegal phoenix activity involves similar activities, but the intention is to exploit the corporate form to the detriment of unsecured creditors, including employees and tax authorities. A phoenix transaction carried out by a company normally brings about the end of the company. If the company’s former suppliers or subcontractors cannot survive without the payments they were receiving from the company, they too may have to close down. Hence, where phoenix activity is involved a failed company might be a phoenix perpetrator or a phoenix victim (or perhaps a phoenix perpetrator as a result of being a phoenix victim!). For simplicity’s sake, this article will focus upon companies/directors that are phoenix perpetrators. To which category of ASIC causes of failure do phoenixing events belong? When looking at a failed company an external administrator might conclude that the company is a phoenix perpetrator (or, to describe the event more accurately, that the directors caused the company to carry out a phoenix arrangement). However, the predetermined list of causes which the ASIC has created doesn’t provide a category that is clearly made for such cases, or a category into which such cases might logically fit. “Fraud” (ASIC cause 8) might be an appropriate category. But if the phoenix activity was “legal” [4.] it may not. Even if “Fraud” is the cause category into which external administrators should, and do, put fraudulent or illegal phoenix cases, then it appears that the commonly accepted extent of such activity is not being reflected in their reports to the ASIC. As chart 1. shows, “Fraud” accounts for only 146 out of 22,606 causes. Furthermore, anecdotal evidence suggests that “Fraud” is regarded by external administrators as referring to dishonesty by employees or outsiders – like the misappropriation of funds, or the abuse of position by employees, or wrongful or criminal deception by outsiders. In a “legal phoenix” case the external administrator might select the cause category of “Other” (ASIC cause 13). The fact that this cause stands at an appreciable 2,726 out of 22,606 on the latest count (see chart 1.) adds weight to that possibility. But because the “please specify” descriptions that are requested and given in this category are not publicly disclosed by the ASIC (and probably not even analysed), we don’t know what is being included in this undefined, catch-all category. In a “legal phoenix” case, and even in an “illegal phoenix” case, the external administrator might – for the purpose of reporting causes of failure – disregard the phoenix transaction, preferring the view that the company failed before implementation of the phoenix scheme as a result of other causes, such as “inadequate cash flow or high cash use”, “poor strategic management of business” and/or “poor financial control including lack of records”. We don’t know whether phoenixing is generally regarded by external administrators as a cause of failure of companies. We don’t know how many phoenix cases – legal and illegal – external administrators encounter. We don’t know whether illegally phoenixing is generally regarded by external administrators as either an offence or “misconduct” to be reported to the ASIC. The above discussion of causes has drawn on information supplied by external administrators in a particular section of the statutory report form EX01. However, the main reason for this form’s existence is to report, as required by the Corporations Act, possible offences that the external administrator has noticed. In Schedule B external administrators are asked to advise whether they are reporting “possible misconduct”. It is possible, therefore, that reports of illegal phoenixing are contained in this main section of their reports. But if this is so, the ASIC’s analysis of the statutory reports received – published in “Insolvency statistics: External administrators’ reports” – does not mention it. In fact, the word “phoenix” appears only once in the latest of those published reports, and then only in a passing manner. Perhaps this is to be expected, given that the word “phoenix” does not even appear in Schedules B and D nor in any other part of ASIC Regulatory Guide 16. However, as “Defining and Profiling Phoenix Activity” explains, acts carried out during conduct of an “illegal phoenix scheme” are likely to be offences under one or more of several sections in the Corporations Act. Also, the acts are likely to breach provisions of the Tax Assessment Act, the Criminal Code Act and/or the Fair Work Act. [4.] . At this point we arrive at the same questions presented by the earlier analysis of the causes of failure. Is the phoenix activity observed by “the front-line investigators of insolvent corporations” [5.] being officially reported to the ASIC? If it is, how does the ASIC know it is, and how is the ASIC putting that information on the public record and before inquiries and researchers looking into phoenix activity? include a question in the misconduct section asking whether the company was involved in a phoenix scheme. “Defining and Profiling Phoenix Activity”, December 2014, Associate Professor Helen Anderson and others. Despite directors receiving official admonishments, detailed instructions and threats about the practice of allowing a company to trade whilst insolvent (see, for example, ASIC Regulatory Guide 217), the curse of insolvent trading seems to be growing. So, in an attempt to reel it in – or perhaps (for the cynical) to reduce the number of reported cases – the Australian Securities and Investments Commission (ASIC) is putting the onus on liquidators to provide “better” information in their statutory reports. Where liquidators of insolvent companies become aware that a past or present director or other officer of a company may have committed an offence, they are required to make a formal report to ASIC. Several years ago ASIC came up with a form and guidelines spelling out the information it wanted from liquidators before it would take their allegations of offences any further. This change came with the introduction of an electronic means of lodging reports, but also occurred after ASIC had become fed-up with receiving offence reports considered by its investigators to be almost worthless. The latest version of this offence report form was released on 18 December 2014. The changes that have been drawn to the attention of liquidators by ASIC concern allegations of insolvent trading. The previous version of the form (July 2008) asked little of liquidators regarding this subject: about all it wanted was a “Yes” or “No” on the availability of documentary evidence. But the new version requires far more. In EX01 reporting of “insolvent trading” is carried out in the section headed Possible Misconduct. If the answer is “Yes”, the liquidator is invited to examine Schedule D of ASIC Regulatory Guide 16 to learn “what is likely to constitute a breach of the relevant section, and the evidence needed to prove such a breach”. Schedule D contains over 6,500 words. There is also a warning “that ASIC may ask you to provide a supplementary report addressing in detail the possible misconduct reported and we may later require further evidence or statements from you for Court purposes”. A description of what is required in the ASIC supplementary report is set out in Schedule C: Supplementary report by receiver or managing controller under s422(2), by voluntary administrator under s438D(2), or by liquidator under s533(2). Schedule C contains about 3,000 words. Liquidators of “assetless companies” are eligible under Regulatory Guide 109 to apply for funding from ASIC for reasonable remuneration and costs in preparing a supplementary report (ASIC form EX03). If, after considering what is involved in answering “Yes”, the liquidator still thinks the misconduct is worth reporting, or filing a complaint, he or she is directed to the section headed “Criminal Offences”. Preliminary details of an allegation of insolvent trading – an offence under section 588G(3) of the Corporations Act 2001 – are sought by ASIC in the usual tick-the-box manner. Up to this section the revised form is practically the same as the previous version. But in the new version, if the liquidator reports a case of insolvent trading and has, or knows of, documentary evidence supporting this conclusion, the liquidator must provide more information by answering several extra questions. These extra questions concern the period of insolvency, the methods and records used to determine the date of insolvency, the amount of debts incurred, and the reasonable grounds for the director had to suspect insolvency. (The actual questions are set out verbatim below, but the heading are mine.) They are the type of questions that a liquidator, especially one with sufficient funds, ought to consider as a matter of course before reaching an opinion regarding the existence (or non-existence) of insolvent trading. Prior to the recent changes, if ASIC saw a completed EX01 form in which the liquidator had alleged a breach of the insolvent trading laws, and had also answered “yes” to questions about the possession or existence of documentary evidence “or other” to support that opinion, ASIC would have then needed to consider whether to investigate. Its task would likely have entailed obtaining, or trying to obtain, from the liquidator the extra information that is now set out in the latest version of EX01. So, as far as the extra demands in the form are concerned, ASIC would probably argue that liquidators are no greater imposed upon now than they were before. But regardless of the information ASIC has or could readily obtain, it often decides not to investigate complaints of alleged offences. For many years this inaction has deeply frustrated a lot of liquidators. Many feel that completing an EX01 form is a waste of their time and also, where there are still funds in the insolvent company, a waste of creditors’ money. Unless the revised EX01 results in greater tangible action by ASIC (increased investigations and prosecutions and not just more detailed statistics), making the form more demanding will aggravate these feelings. It might even see an increase in the non-reporting of insolvent trading offences (see the new question “Reasons for not reporting insolvent trading”), or in “no” being the liquidator’s response when it really should be “yes”. ◻ Evidence showing that the director/directors had an opportunity to prevent the company from incurring the debt and did not. Such evidence could include: • documents evidencing discussions with the directors, employees and creditors concerning the circumstances surrounding the incurring of particular debts; • correspondence or other documents relating to the circumstances surrounding the incurring of the debt. ◻ Evidence showing that the failure was dishonest (i.e., the director/directors incurred the debt with the knowledge that it would produce adverse consequences, the failure was intentional, wilful or deliberate, and it included an element of deceit or fraud). Such evidence could include: • documents evidencing discussions with the directors, employees and creditors concerning the circumstances surrounding the incurring of particular debts; • correspondence or other documents relating to the circumstances surrounding the incurring of the debt. Has a creditor commenced, or indicated that they intend to commence, action to recover compensation for loss resulting from insolvent trading? Insolvent trading may also be a breach of civil penalty sections 588G(1)-(2) of the Act. The revised form EX01 also seeks details of allegations of this nature, by asking about the period of insolvency, the methods and records used to determine the date of insolvency, the amount of debts incurred, and the reasonable grounds for the director had to suspect insolvency. The questions are practically the same as those asked when a criminal offence is alleged (see above). In the previous version of EX01 only three brief questions were posed, which concerned the availability of evidence and the perceived legitimacy of a director’s defence. A story by Michael Murray of the Australian Restructuring Insolvency & Turnaround Association (ARITA) brings news that the Australian Securities and Investments Commission (ASIC) has commissioned the Queensland University Business School to investigate “approaches that can be used to improve director co-operation with liquidators and director compliance with their statutory and other obligations”. ASIC appears to be looking for styles of approach that are more scientific and more savvy. 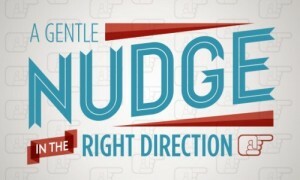 The news story suggests that an approach to be considered is that of the “pure nudge”, the “assisted nudge” and the “shove”. ASIC seems to be keen to try the “nudges” experiment. In its April 2014 submission to the Financial Systems Inquiry ASIC recommends that it should have a more flexible regulatory toolkit such as would enable it to intervene in the financial product and service supply chain by way of ‘shoves’ and ‘nudges’ to achieve regulatory outcomes that more effectively meet the needs of investors and consumers. It suggests that simple “nudges” are likely to achieve cost-effective results in many cases. “Liquidators will be aware that director compliance can be variable and that non-compliance can ultimately call for prosecution of the directors, adversely distracting liquidators from their duties and imposing costs on creditors. The behavioural economics approach seeks to influence and direct director behaviour in order to promote positive reinforcement and indirect suggestions in order to achieve compliance. At a simple level, it could be applied to refine the form and content of letters sent by liquidators to directors stating their obligations. Improvement of the report as to the company’s financial position (the RATA) is another coalface example, ARITA research showing that it can be a daunting, unduly complex and difficult document for directors to complete: Peter Keenan, Terry Taylor Scholarship Report 2011. 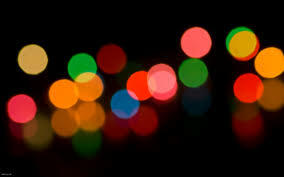 In some circumstances, small changes can give effect to significant behavioural changes. ARITA sees this research as very worthwhile and it mirrors similar approaches being taken by the Australian government in other areas – see Influencing Consumer Behaviour: Improving Regulatory Design, Office of Best Practice Regulation, Department of Finance and Deregulation. Among many issues, that paper discusses the concepts of a “pure” nudge, an “assisted” nudge and ultimately a “shove”, in seeking regulatory compliance. Such approaches are used by revenue authorities in Australia and internationally. For example, in the UK, a change in the wording of letters sent to those owing income tax was claimed to have resulted in an extra £200 million in tax being collected on time. ARITA also sees potential for research into the behaviour of directors at the pre-liquidation stage, that is, in managing a failing company that is heading towards collapse – what may usefully be used to prompt directors to take action or seek advice? to have a more real perception of the company’s financial position? to more positively react to possible insolvent trading liability and to the company’s creditors? and many other such issues. We also see potential for this research to be applied in personal insolvency. ARITA is monitoring the progress of this research and its outcomes. Any comments or questions? to Michael Murray, Legal Director, ARITA. 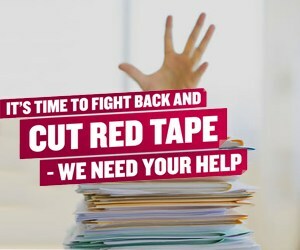 Australia’s corporate regulator, the Australian Securities and Investments Commission, estimates that 10 per cent of its 362 statutory forms could be removed, consolidated or streamlined in the name of reducing “red tape”. This is revealed in Report 391 – ASIC’S deregulatory initiatives, published on 7 May 2014. A number of the forms identified for removal are currently required to be provided to ASIC under the law, but provide information that might not be necessary for ASIC to hold. Subject to stakeholder comments, we may suggest that these forms be removed through legislative amendment. * NOTE: The phrase “Information not used by ASIC” used in the Appendix appears to be an abbreviation of the phrase “information not required or used regularly by ASIC or the public”. In recent years the uptake of cloud computing services by Australian businesses has increased dramatically. One common characteristics of cloud computing is that business books and records are held outside the Australian jurisdiction. Under section 289 of the Corporations Act 2001 “if financial records about particular matters are kept outside the (Australian) jurisdiction, sufficient written information about those matters must be kept in this jurisdiction to enable true and fair financial statements to be prepared (and) the company must give ASIC written notice in the prescribed form of the place where the information is kept”. The proposed removal of Form 313 shows that this requirement is to be abolished. 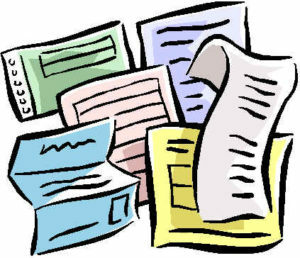 Form 905A Notification of ceasing to act as or change of details of a liquidator. 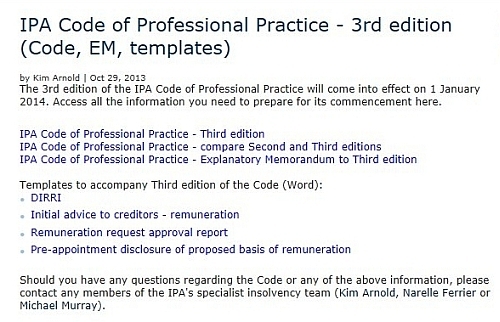 The Australian Insolvency Practitioners Association (IPA) today released the third edition of its Code of Professional Practice, together with a new Explanatory Memorandum, a document showing all changes, and four templates for insolvency practitioners to use as guides when preparing such documents for creditors. Melbourne liquidator Andrew Leonard Dunner is likely to be prohibited from being registered as a liquidator for 5 years, following a decision by the Federal Court in an action brought against him by the Australian Securities and Investments Commission (ASIC). “In handing down his reasons for judgment today, Justice Middleton found that Mr Dunner had failed to adequately investigate the circumstances and affairs of companies to which he was appointed and had inaccurately reported to ASIC and creditors. “The Court also found that he had drawn remuneration in excess of $600,000 without appropriate approval or adequate supporting documentation. The Court considered it appropriate that he should repay that remuneration and have leave to apply to the Court for justification of an entitlement to recoup remuneration where appropriate. Justice Middleton found that Mr Dunner’s conduct indicated ‘…a systemic failure of administration and internal protocols, as well as (in a number of instances) extremely poor professional judgment. In this way, Mr Dunner has failed to satisfy the high standards of conduct required of his offices’. To see the ASIC media release, CLICK HERE. To see Justice Middleton’s important 67 page report and judgment, CLICK HERE . Australian Securities and Investments Commission v Dunner  FCA 872. 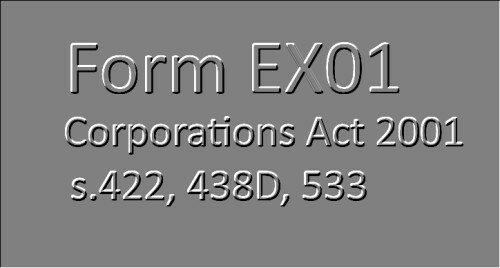 CORPORATIONS – Corporations Act 2001 (Cth), ss 423, 499, 536 – Duties of liquidator – Duties of receiver – Court inquiry into defendant’s conduct as liquidator and receiver – Failure by defendant to investigate circumstances of companies to which he was appointed – Drawing remuneration without approval or adequate supporting documentation – Inaccurate reporting to ASIC and creditors regarding external administrations – Repayment of remuneration drawn without approval – Unfitness to remain registered as liquidator – Duration of prohibition order. I have created – in Microsoft Excel format – the current Australian statutory companies Report as to Affairs form. It is free to download and/or view from my website. Click HERE for the forms page and look for Form 507, MS Excel version. The Advanced Medical Institute Pty Ltd [ACN 117 372 915] and AMI Australia Holdings Pty Ltd [ACN 095 238 645] are under external administration. Trent Hancock and Michael Hird, of accounting firm, BDO, Sydney, were appointed Joint Voluntary Administrators by Life Science Group Pty Ltd, a secured creditor of both companies, in December 2010. “Today, the Australian Competition and Consumer Commission obtained interim orders by consent against Advanced Medical Institute Pty Limited (administrators appointed) and AMI Australia Holdings Pty Ltd (administrators appointed) – collectively referred to as AMI. In proceedings filed on Wednesday, the ACCC alleged that AMI failed to advise existing and potential clients that it is in administration, is insolvent and may not be able to provide goods and services after determination of the administration period. The ACCC also claimed that AMI had wrongly accepted payments in advance for treatments when there is a real risk that AMI will not be able to continue to supply its treatments, and that clients will not receive refunds claimed by them, after the conclusion of its administration. there is a real risk that AMI will not be able to continue to supply its treatments to patients and that patients may not receive refunds claimed by them, after the conclusion of its Administration.” …. “a company under administration must set out, in every public document, and in every negotiable instrument, of the company, after the company’s name where it first appears, the expression (“administrator appointed”)”. Section 88A of the Act gives the meaning of the phrase “public document” of a corporation. It appears to me to be wide enough to include an advertisement published on the internet by the corporation; and a website or blog published by the corporation. Breaches of sections 450E(1), 428 or 541 are strict liability offences, meaning there is no requirement that the prosecution prove intention, knowledge, recklessness, negligence or any other variety of fault. So it would be prudent for insolvency practitioners to ensure that the internet advertisements, websites and blogs of companies they control carry the required notice.